UNICS Kazan came up with its best defensive performance in years and against a team that came into the game ranked third in scoring with 86.4 points per game. UNICS ran away from MoraBanc Andorra in the second half and registered a 72-53 victory that propelled it to first place in Group H.
This was the fewest points UNICS allowed in any EuroCup game since November 2010 when it held Banvit Bandirma to 52 points in a regular season game. 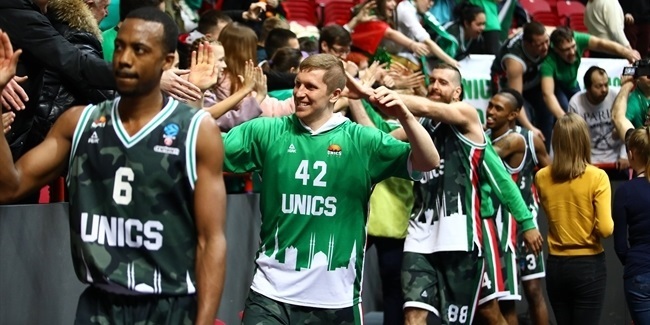 And it's a performance that earned UNICS home-court advantage in the quarterfinals, pitting it against its fellow Russian side Lokomotiv Kuban Krasnodar in the best-of-three series. "The important thing is the home-court advantage [for the quarterfinals], everything else I will say is the same," Coach Dimitris Priftis explained about facing a mighty opponent. "All the teams are very tough and have quality. You play at home and that is much better than to travel. That is the main reason we fought for today. Loko is a very good team. All the teams are very good right now." For a game where it needed to win by 6 points, UNICS did not start to its liking. Shots were dropping on both ends and the scoreboard showed 15-16 after just 5 minutes and 20 seconds. It did not look like it would be anything like the defensive game it turned out to be. UNICS failed to score a single basket for the next 7 minutes and it did not look promising. "We fought through adversity, rolled with the punches and just kept fighting," UNICS playmaker and the EuroCup's Regular Season MVP Pierria Henry said after the game. "We kept applying pressure and executed our game plan to the T."
However, UNICS fought out of the hole it went into and went on to allow just 36 points over the final 35 minutes, including holding MoraBanc to just 3 field goals and 3 free throws in the fourth quarter. 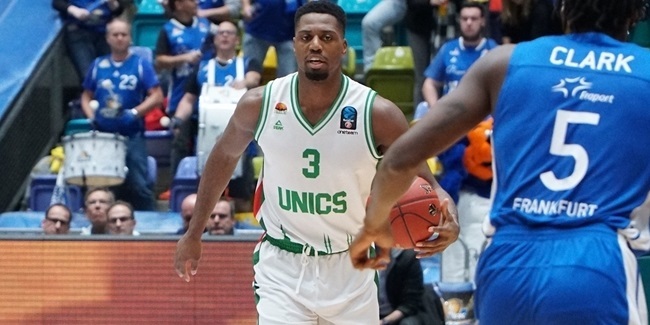 UNICS also used a 20-5 run, sparked by a triple from Henry, that bridged the third and fourth quarters and paved the way to a big victory over a team previously undefeated in the Top 16. "I have to give all respect and salute my teammates and the coaching staff for not folding under pressure, and just not giving up," Henry added. No team will dare to look past its next opponent, but we can. 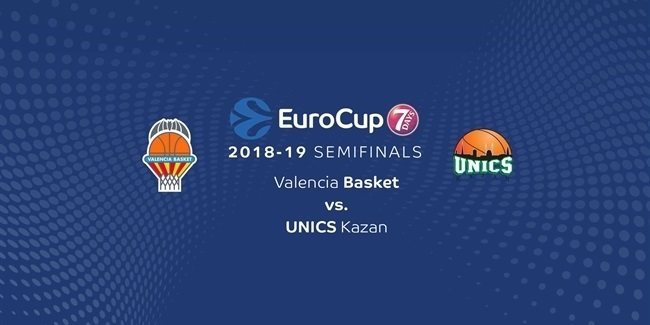 This victory assured that UNICS finished with the second-best record in the Top 16, giving it home-court advantage in any series other than against Valencia Basket. Being undefeated, 8-0, at home this season, UNICS should feel pretty good about what's next to come. "Everybody is 0-0 at this point. We have to stay focused and realize we have another challenge in front of us, and we got to accept it and go crazy. And do what we do, go and play UNICS basketball," Henry finished.